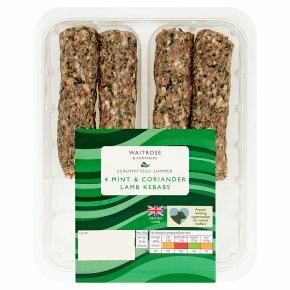 INGREDIENTS: lamb (72%), coriander (7%), mint (6%), onion, rice flour, lemon zest, potato starch, garlic purée, maize flour, ground coriander seeds, cumin, salt, maize starch, preservatives (sodium metabisulphite, sulphur dioxide), antioxidant (sodium ascorbate), dextrose monohydrate, black pepper, cardamom seeds, ground cloves, nutmeg. Time: 18-20 minutes. Preheat grill. Remove all packaging. Place on a grill pan under a medium heat and turn occasionally. Cook thoroughly until the juices run clear and there is no pink meat.